(Bloomberg Opinion) -- It could have all been so different. 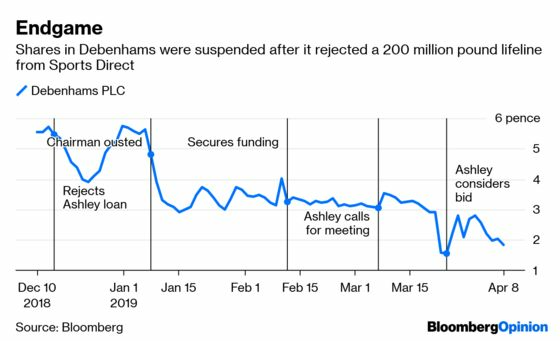 Debenhams Plc, is expected to be taken over by its lenders in a restructuring after they rejected a 200 million-pound ($261.6 million) lifeline from Sports Direct International Plc. The equity, including the 30 percent stake held by the sportswear retailer, will be wiped out. The shares were suspended early Tuesday. After operating for more than 200 years, the company’s failure to react quickly enough to changes in the retail industry, combined with the strain of onerous store leases, stretched Debenhams’ finances. It faced either a takeover by its lenders, or by billionaire Mike Ashley’s Sports Direct. It was a bad situation, but this result looks like the worst outcome for everyone. Lenders are not natural retailers. They want to make a return on their investment, so won’t be disposed to making the long-term investment needed to nurture the business back to recovery. They’ll also be more inclined to strip out assets, in this case, perhaps by selling off Debenhams’ Danish department store chain Magasin du Nord. Ownership by Ashley’s Sports Direct would have been a better option. While he has hardly endeared himself to the Debenhams board or lenders with his increasingly erratic behavior, he is an experienced retailer. Sports Direct also owns House of Fraser. Putting the two department store chains together has some logic. There could be operational synergies, for example in buying products. The enlarged group would have more clout with suppliers, such as the big cosmetics houses. Even more importantly, the two could stop competing against each other and focus on fighting the John Lewis Partnership. Now that a so-called prepack administration looks to be on its way, those benefits look to be slipping away. True, Ashley could yet acquire Debenhams. He reiterated on Tuesday that he was still considering a cash offer that would value the chain at about 61 million pounds, though this doesn’t look likely to be accepted. A Sports Direct statement on Sunday accused Debenhams of locking him out of the ability to acquire the bonds, something the group denies. But that could be a future line of attack. Ashley played a long game with House of Fraser, pursuing it for five years before he took control. He could get the same chance with Debenhams, pouncing if either the board or lenders slip up. But if this doesn’t happen, and if House of Fraser proves trickier to fix, he could well decide to walk away from department stores altogether.